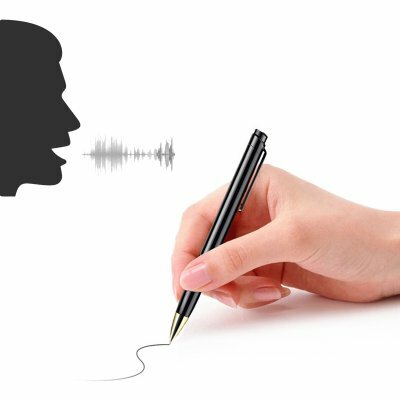 Successfully Added Aiworth Digital Voice Recorder Pen – Built-in Microphone, Ballpoint Pen, 8GB Storage, Sleek Body to your Shopping Cart. This fashionable black ballpoint pen comes from Aiworth, more than your ordinary pen. In its smooth body packaging, this pen is characterized by built-in microphone. This allows your recording pen to keep track of meetings, lecturers, or presentations. The voice recorder supports a total of 8GB storage. Thanks to this, you don't have to worry about occupying space at any time to store your recording. Because of its unique ballpoint pen design, no one will expect this gadget to keep the built-in microphone. With its 180Ma battery, it gives you a total of 30 hours of recording time at one time. Besides recording and writing, and it could upload your songs to your pen and plug in the computer, and you are ready. This two in one pen is the perfect thing for students and business people. Whether you use it to record meetings, listen to music, or just do some notes - this recording pen is guaranteed to meet your requirements. Its sleek design and fashionable black, this professional pen is a great asset for anyone there. This voice recorder pen comes with a 12 months warranty, brought to you by the leader in electronic devices as well as wholesale electronic gadgets..